This is one of those crock pot recipes that only has a few ingredients that you throw together in less than 5 minutes and you end up with a delicious meal a few hours later. I think it was harder to wait for the egg noodles to finish cooking than it was to make the chicken. My whole family loved this! Homemade cream of chicken soup works great for this recipe. It’s easy and fast to make and calls for a few pantry essential items, so you probably have all the ingredients needed for it in your home right now. You can also make it gluten free by using a gluten free flour! In a small mixing bowl, combine cream of chicken soup, ranch dressing mix, chicken broth, garlic powder, parsley flakes, paprika, and oregano. Add chicken to slow cooker and pour sauce over the chicken. Cover and cook on low for 4-5 or high for 2-3 hours. 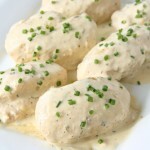 Remove chicken and stir cream cheese into the sauce until smooth. Put chicken back in the slow cooker and serve over cooked egg noodles. Drizzle with extra sauce. This is the Crock Pot I own and love. It’s large and works great, but I especially love that the locking system on the lid. It makes it easy to transport food to family parties or pot lucks. Posts may contain affiliate links. If you purchase a product through an affiliate link, your cost will be the same but My Mommy Style will receive a small commission. Your support is greatly appreciated. Linked back with Posed Perfection, A Dish of Daily Life, The Pin Junkie and Saving 4 Six.